What does the man with the bionic eyes see? A unique film showing how artificial and natural sight have been combined for the first time in history. The film explores the damage of sight loss caused by Age Related Macular Degeneration (AMD) and how, with the use of the ground-breaking bionic eye technology, vision can be improved. The artist, Lucy Burscough is bringing the pioneering work of Paulo Stanga, Professor of Ophthalmology and Retinal Regeneration, to life with Ocular Bionica, an exquisitely painted stop-frame animated film made in a hospital setting with support from Arts Council England’s National Lottery funded Grants for the Arts programme. Dry AMD is the more common form of the condition and causes the cells in the macula to stop working over time. It causes problems with looking straight ahead such as when reading, watching TV and recognising faces. Professor Stanga, Consultant Ophthalmologist and Vitreoretinal Surgeon, undertook the world-first procedure to implant dry AMD patient, Ray Flynn, with the Argus II ‘bionic eye’. Ray is the first person in the world to have combined artificial and natural vision. The film tells the story of Ray, who underwent the four-hour operation to have the bionic eye implanted in June 2015. With the Argus II system switched on, Ray is able to make out the outline of people and objects even with his eyes closed. With his eyes open, Ray successfully combines vision from his artificial vision with his remaining natural vision. Lucy’s film is a world first – because it shows what this looks like for Ray. Lucy spent time interviewing Ray about how he got involved in the clinical research trial and his experiences of taking part. 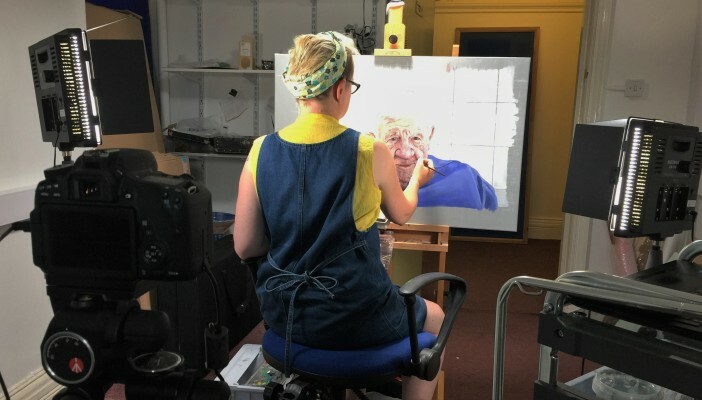 She has painted detailed and vivid pictures including Ray, Professor Stanga and his team, to illustrate the development of the study and how it came to change Ray’s life. Lucy said: “This work has been inspired by remarkable, cutting-edge technologies that hint at a future of biomedical bionics and the hacking of humanity. The film seeks to show viewers the world through Ray’s eyes, both before and after the device was fitted. Professor Stanga, who is also Professor of Ophthalmology & Retinal Regeneration at The University of Manchester and Principal Investigator on the trial to test the usefulness of the Argus II in patients with total central vision loss due to AMD, said: “Lucy’s work depicts two unique aspects of sight loss for the very first time, which greatly adds to our understanding – and empathy with – a blind patient’s experience. “The first is that Lucy has interpreted Ray’s ability to successfully combine artificial vision from the Argus II in his central visual field with his remaining natural vision, which is at the periphery of his sight. “On a personal level, this is a very moving as well as an exciting experience, to literally see through Ray’s eyes and experience the real visual function benefits Ray has gained from his artificial vision. The film clearly shows how the Argus II system provides basic shapes and outlines of objects (or people) to fill in a gap in the centre of Ray’s sight destroyed by AMD, while he is still able to discern detail and colour using his natural vision, not affected by the AMD, at the corners of his eye. The film can be watched on Lucy’s website alongside her other impressive work. Keep up to date with the project on Lucy's Twitter and Facebook feeds. Find out more about the Argus II study into the new bionic eye. The research study is now closed for recruitment and is currently not looking for patients to take part. However, if you are interested in taking part in research conducted by Professor Stanga, please email [email protected] and/or visit www.research.cmft.nhs.uk. Find out more about AMD.